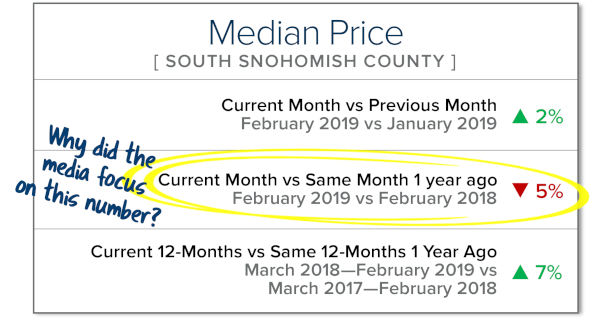 SOUTH SNOHOMISH COUNTY: Months of inventory was reduced as we finished out the first quarter of 2019. Months of inventory is the amount of months it would take to sell out of homes if no new listings came to market. This illustrates the balance between supply and demand. We peaked at 2.8 months in September of 2018 and found ourselves at 1 month this March. 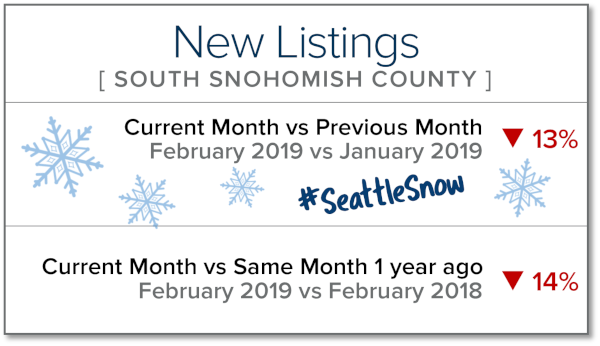 This is only a snapshot of the trends in south Snohomish County; please contact us if you would like further explanation of how the latest trends relate to you. 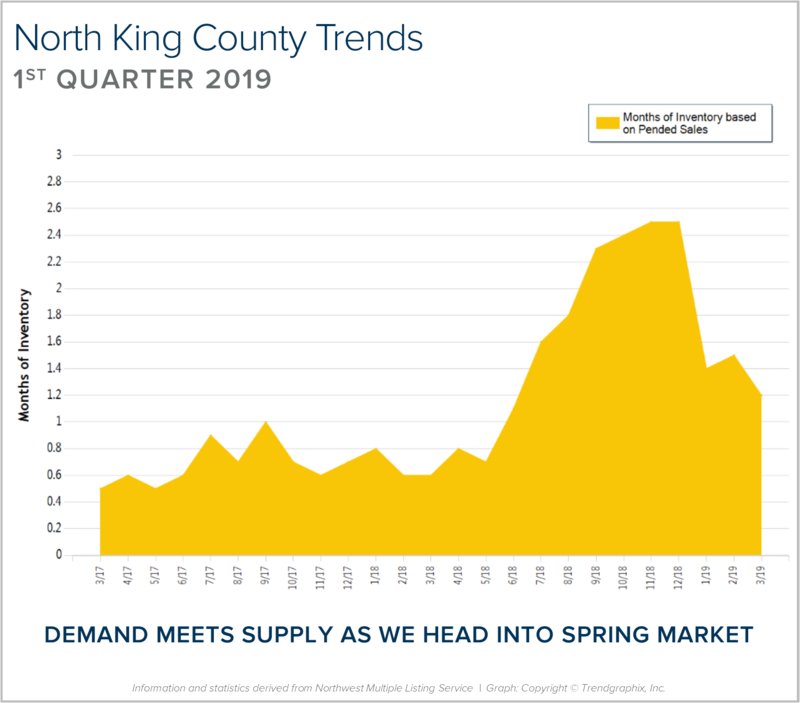 NORTH KING COUNTY: Months of inventory was reduced as we finished out the first quarter of 2019. Months of inventory is the amount of months it would take to sell out of homes if no new listings came to market. This illustrates the balance between supply and demand. We peaked at 2.5 months in November of 2018 and found ourselves at 1.2 month this March. This is only a snapshot of the trends in north King County; please contact us if you would like further explanation of how the latest trends relate to you. 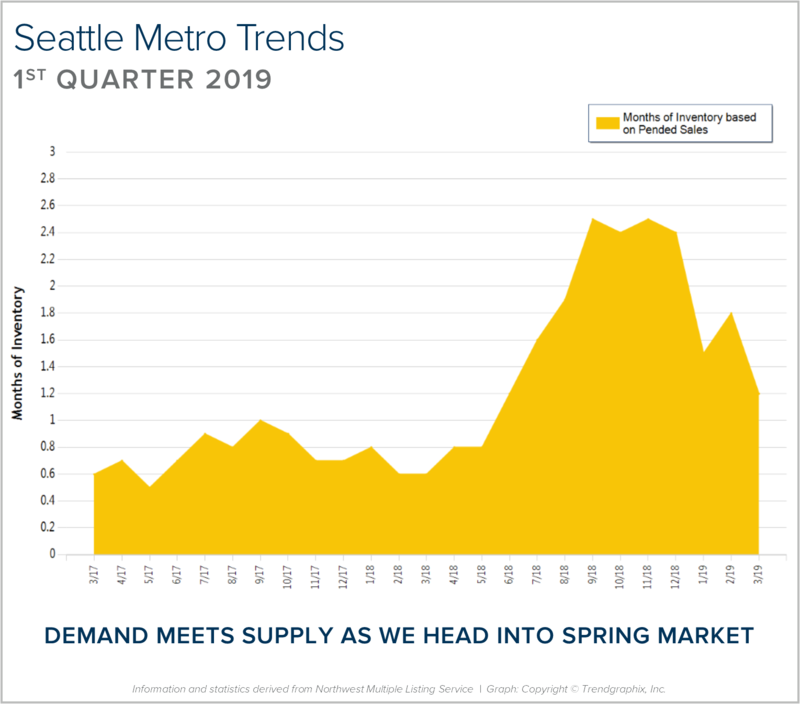 SEATTLE METRO: Months of inventory was reduced as we finished out the first quarter of 2019. 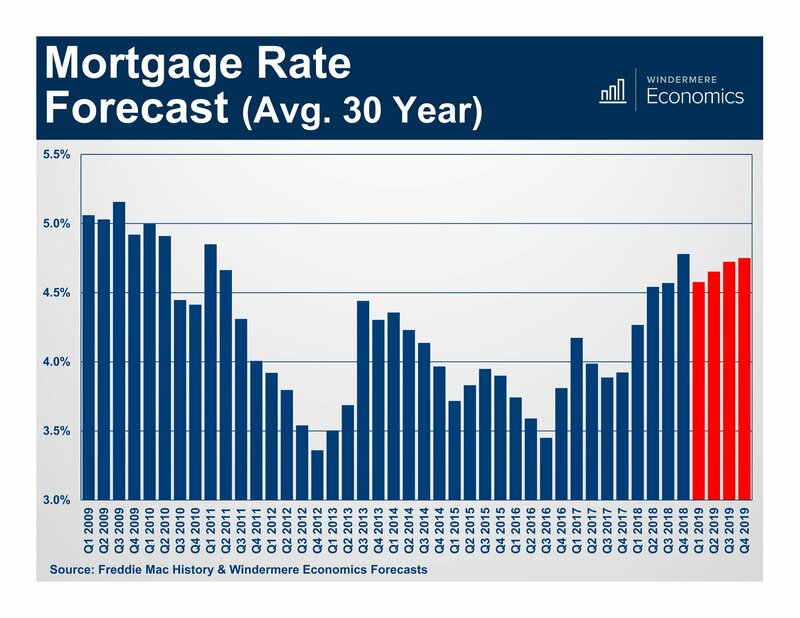 Months of inventory is the amount of months it would take to sell out of homes if no new listings came to market. This illustrates the balance between supply and demand. We peaked at 2.5 months in November of 2018 and found ourselves at 1.2 month this March. This is only a snapshot of the trends in the Seattle Metro area; please contact us if you would like further explanation of how the latest trends relate to you. 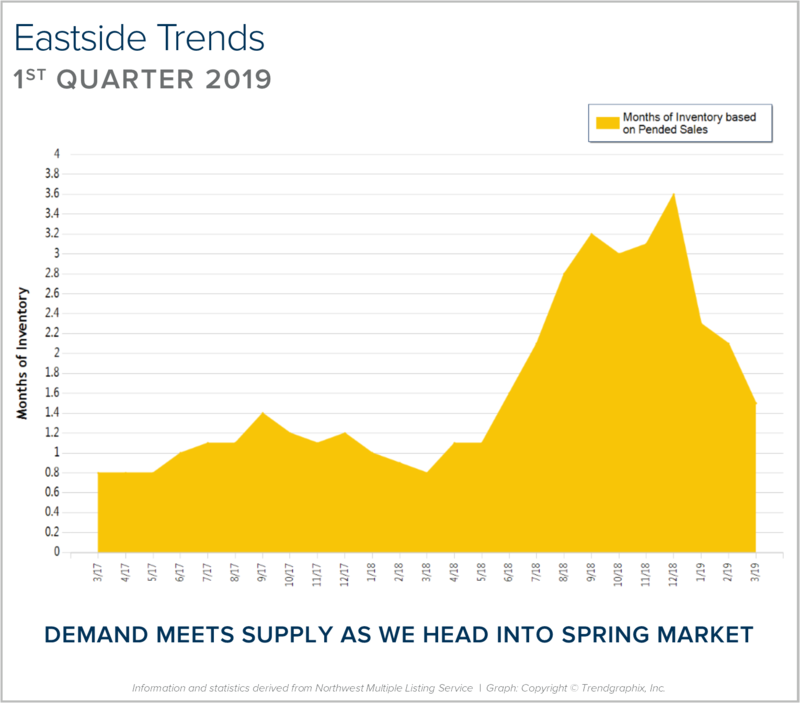 EASTSIDE: Months of inventory has reduced as we finished out the first quarter of 2019. Months of inventory is the amount of months it would take to sell out of homes if no new listings came to market. This illustrates the balance between supply and demand. We peaked at 3.6 months in December of 2018 and found ourselves at 1.5 months this March. This is only a snapshot of the trends on the Eastside; please contact US if you would like further explanation of how the latest trends relate to you. 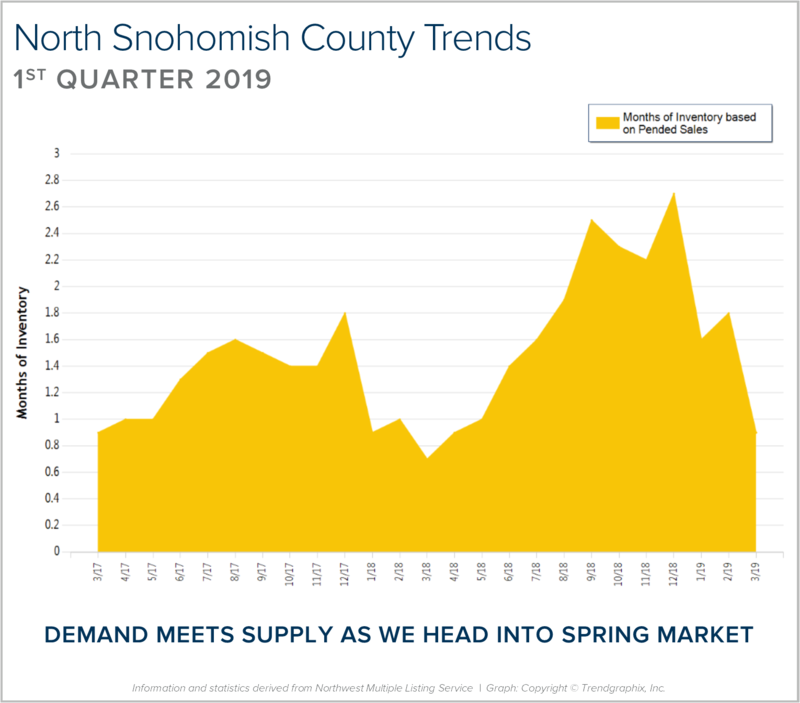 NORTH SNOHOMISH COUNTY: Months of inventory was reduced as we finished out the first quarter of 2019. Months of inventory is the amount of months it would take to sell out of homes if no new listings came to market. This illustrates the balance between supply and demand. We peaked at 2.5 months in September of 2018 and found ourselves at 0.9 month this March. 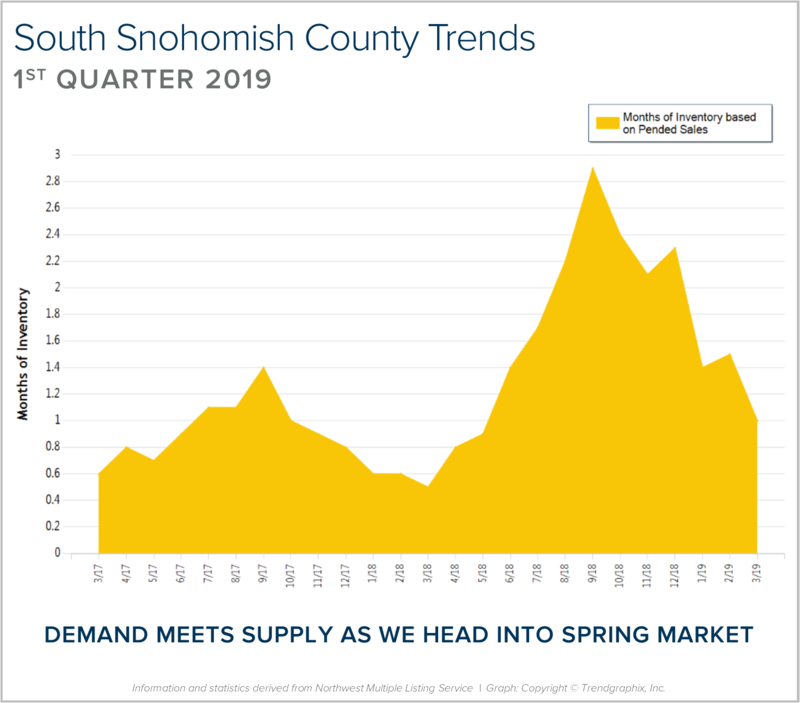 SOUTH KING COUNTY: Months of inventory was reduced as we finished out the first quarter of 2019. Months of inventory is the amount of months it would take to sell out of homes if no new listings came to market. This illustrates the balance between supply and demand. We peaked at 2.9 months in September of 2018 and found ourselves at 1.2 months this March. The first quarter of 2019 saw 2,306 new listings and 2,096 pending sales – demand tracked with supply quite well! It remains a seller’s market (0-3 months of inventory), but not as constricted of a market as last year, which saw an average of 0.8 months in the first quarter compared to 1.5 months this year. 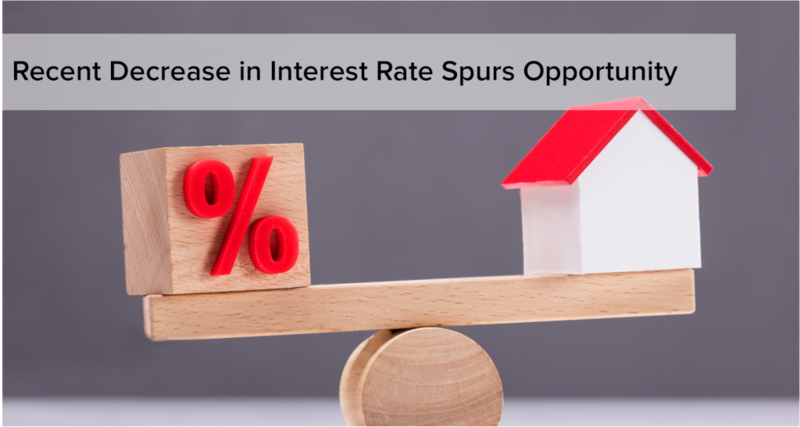 As we head into spring, we should see continued growth in new listings and demand will be strong, fueled by low interest rates and positive jobs reports. 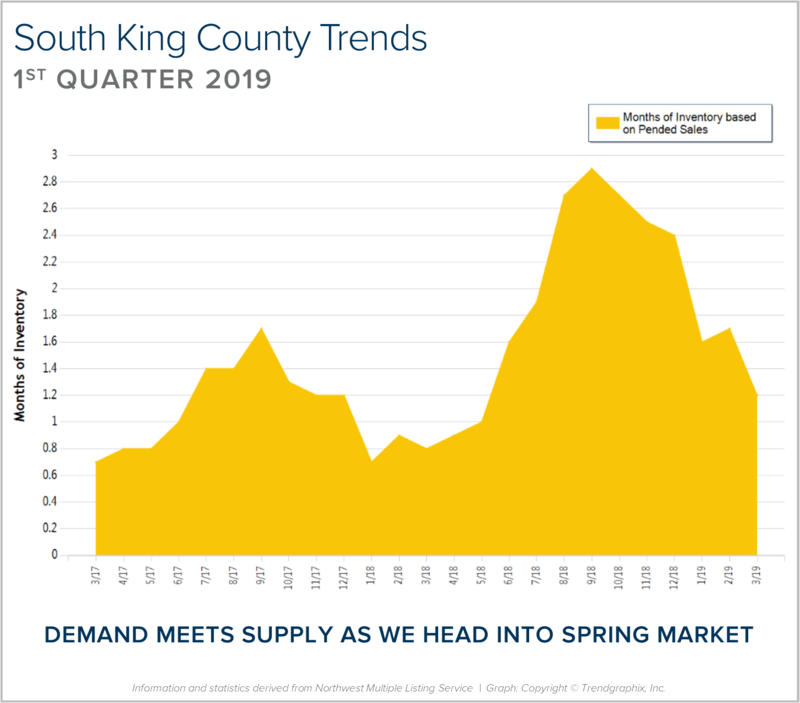 This is only a snapshot of the trends in south King County; please contact us if you would like further explanation of how the latest trends relate to you. 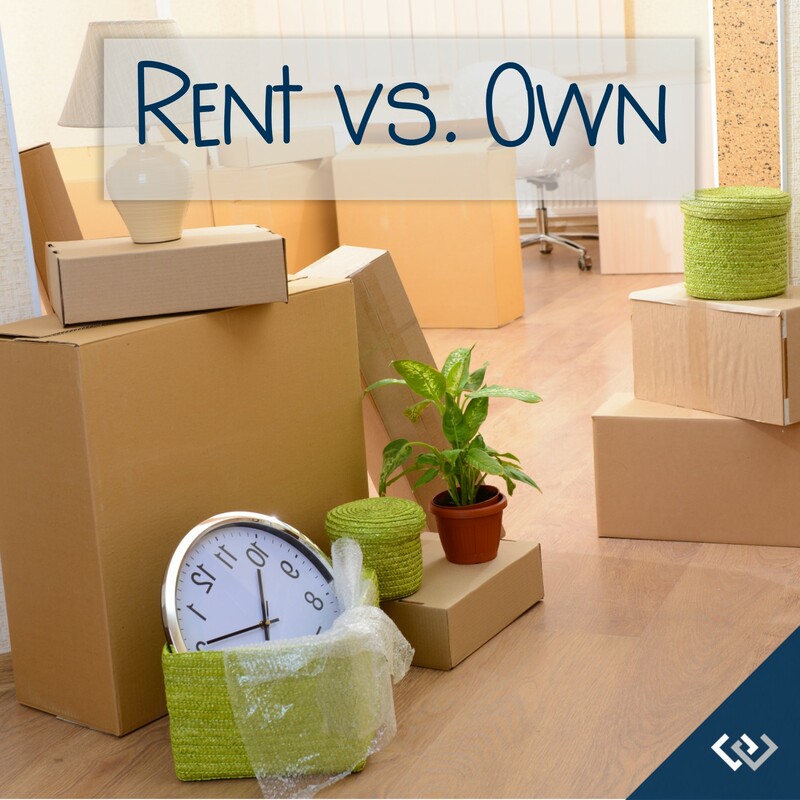 Is it better to rent or own? Whether you hire an outside professional for help, or tackle the project yourself, now is a great time to get a jump on spring cleaning. Many people wait for warmer temps to start cleaning, but I think most everyone can agree that those weekends would be better spent outdoors, soaking up that sun. 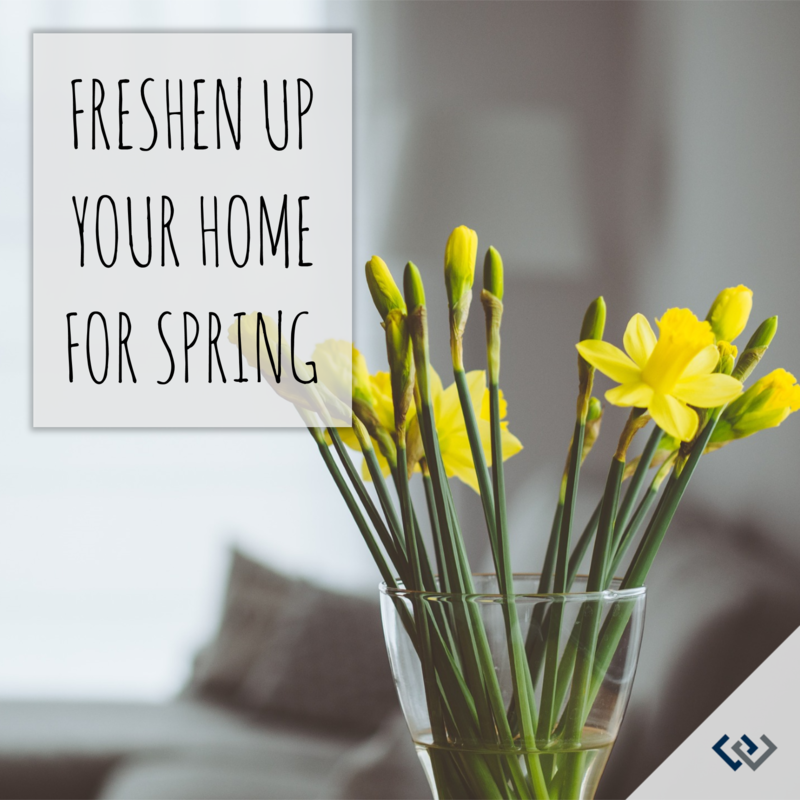 So, take some inspiration from the list below to get you started now on freshening up your home for spring. It will only take a few hours to check everything off this list, and you’ll feel so much better enjoying the last few weeks of winter, knowing that when the warmer weather finally comes, you can get outside and really enjoy it! Rotate your mattress. Most mattresses need to be rotated regularly in order to even out the overall wear and prolong the lifespan of your bed. However, keep in mind that Sleep Number and Tempur-Pedic mattresses typically should not be rotated. Always check with your manufacturer for their recommendations on your specific mattress. If you own an older mattress with no pillowtop, it should probably be flipped as well as rotated. Clean your mattress. Strip the mattress of all linens and covers. Start by vacuuming the mattress with the upholstery attachment, paying close attention to crevices and seams. Next, sprinkle baking soda (up to a one-pound box) all over the surface of your mattress. Let this sit for at least an hour, but 24 hours is best. Then go back over your mattress with your vacuum’s upholstery attachment again. If you have a steam cleaner, break it out and go over your whole mattress. The steam will reach further into the mattress than your vacuum is able to, and kills dust mites. *It is generally not recommended to clean memory foam with a steam cleaner. Organize & clean the laundry room. Clean the outside of your washer and dryer; scrape any dried detergent from crevices. Next, clean the inside of the washing machine. Most newer models have a self-cleaning cycle. If you have an older machine that does not have a self-cleaning cycle, run a cycle with hot water and a quart of white vinegar. After it is finished, clean the detergent dispensers, using a vinegar and water solution and a scrubber. If you have a front-loader, be sure to clean the rubber seal on the door. This area is prone to mold growth, so use an all-purpose cleaner or maybe even bleach to get under and around the seal. Next, organize a bit. 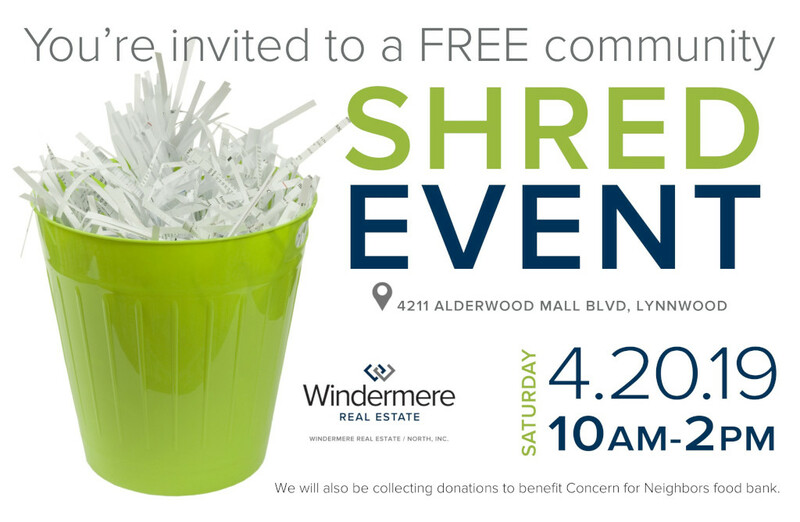 Throw away products you never use, replace damaged sorting bins, and don’t forget to clean out the dryer vent to prevent a fire. Deep clean the fridge. Twice a year (or more), you should give your fridge a front-to-back, top-down scrubbing. Start by taking everything out and throw away anything that has expired. Next, remove all the shelves and drawers. Put them to soak in a solution of two tablespoons baking soda and one-quart hot water. While they are soaking, wipe down the interior of the fridge with the same solution. Then scrub, rinse and dry the shelves and drawers. Next, dry the drip pan. Remove the base grill, and pull out the drip pan. If it’s full of water, mop it with paper towels and wash the pan with soapy water. If your drop pan is fixed in place, wrap a cloth around the head of a long-handled brush and use to clean the pan. Don’t forget the coils. In order to keep your refrigerator running efficiently, unplug it, pull it away from the wall, and use a coil brush or your vacuum’s crevice attachment to clean the condenser coils. This should be done at least twice a year, unless you have pets in the home, and then you should do this three to four times a year. Clean out spice cabinet. Throw away all expired spices and seasonings. Not only do these lose taste, they actually harbor mold and bacteria. Clean out expired medications & vitamins If you have unused medications, please take them to your local pharmacy for proper disposal. Add color to your table. 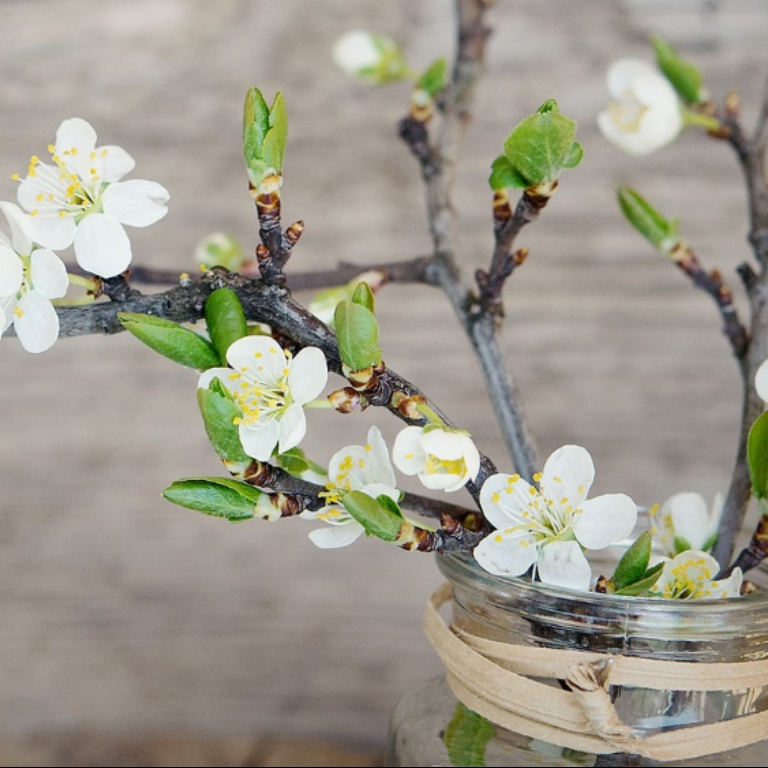 Treat yourself to fresh flowers while waiting for the spring blooms outside. And if you’re ready to get some deep cleaning done, check out this blog for the Ultimate Spring Cleaning Checklist.